The Navy will not conduct sonar training in blue whale habitats off the coast of San Diego for the next three years, according to the settlement of a pair of lawsuits approved Monday by a federal judge in Hawaii. In settling the lawsuits, which sought to protect whales and other marine mammals, the Navy agreed not to use mid-frequency active sonar for training and testing in the blue whale habitat, or farther off the coast between Santa Catalina Island and San Nicolas Island. 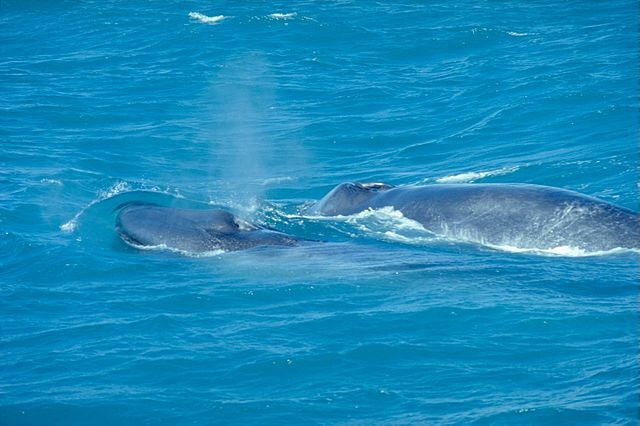 Navy surface vessels must also use “extreme caution” and travel at a safe speed to minimize the risk of ship strikes in blue whale feeding habitat and migratory corridors for blue, fin and, gray whales, according to the settlement. Similar restrictions, plus one restricting the use of powerful explosives for training, were put in place for the waters off Hawaii. According to Earthjustice, an organization of environmental lawyers, the decades-long litigation has been designed to get the Navy and National Marine Fisheries Service to comply with the law, acknowledge that military activities harm marine mammals and take steps to reduce the impacts. Environmentalists, led by the Natural Resources Defense Council, believe the high-intensity sound waves produced by sonar hurt dolphins, whales and other marine mammals, causing them to beach themselves in some cases. Some Navy sonar systems generate underwater sound waves as loud as 235 decibels, almost twice the noise levels of the rock band AC/DC in concert, according to the NRDC. In 2008, the U.S. Supreme Court ruled that the Navy could be exempted from certain environmental rules.